Getting Dental Implants in Farmington is as Easy as 1, 2, 3! Are you interested in replacing your missing teeth? If so, you’re actually making one of the best decisions you can for your oral health! The process may be a foreign concept for anyone that’s not a dentist. That’s why your dentist is here to explain how patients get dental implants in Farmington and why they’re worth the investment! Dental Implants Are the Next Best Thing to Your Natural Teeth! If you have a missing tooth or multiple, replacing them with dental implants is one of the best things you can do for you oral health and your aesthetics. Many may not know that dental implants are a permanent solution for tooth loss and can save many patients from the consequences of long-term tooth loss. 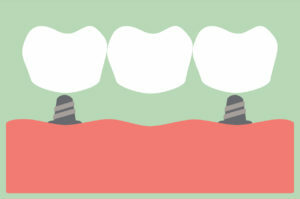 An implant replaces both the tooth root and crown by surgically placing the implant post. This is an essential component of successful implant placement. It helps to stabilize your smile and jawbone, while serving as anchors for permanent restorations like crowns, bridges, and dentures all at the same time. Getting a Dental Implant is Easy, Too! After your consultation, patients need to undergo the actual placement of their implants. In most cases, your dentist will refer you to a seasoned oral surgeon that specializes in implant placement. Since implants essentially start with small titanium posts that are placed directly into your gum tissue, you should be prepared to undergo oral surgery. During the placement stage, one or more metal implant posts will be placed in your jaw during an intricately planned procedure. Afterwards, a period of healing time will be required for the implants to create a strong bond with your oral structures. This process is known as osseointegration. One your mouth is completely healed, you’ll return to your dentist to have your custom-made dental prosthetics placed for good! You Can Benefit From Dental Implants! Dental implants preserve your remaining teeth because you won’t have to alter their structures to support replacement teeth. Dental implants will preserve bone density and significantly reduce jawbone deterioration that can come from long-term tooth loss. Dental implants have been shown to reduce the need for subsequent restorative dentistry for neighboring teeth. Implants last for a much longer than other forms of restorative dentistry. Implants can help you chew your food better and speak more clearly. Dental implants will improve your facial appearance by building your jawbone and reversing the aging facial appearance that comes with tooth loss. Dr. Cole takes pride in creating beautiful, healthy smiles. This is the best way that he can make a positive impact on people’s lives, and nothing gives him more happiness than helping a patient become more confident in themselves and their smile through dentistry. If you would like to speak to your dentist in Farmington about replacing your teeth with dental implants, feel free to call our office! Comments Off on Getting Dental Implants in Farmington is as Easy as 1, 2, 3!